Over the last 50 years Western governments have paid out more than £400bn of tax payers' money in aid to Africa, but according to figures released by the World Bank this year, half of sub-Saharan Africans still live in extreme poverty, a figure which has not changed since 1981. And though foreign aid has helped lift millions of Africans out of poverty by helping developing economies to grow, for the poorest Africans little has changed. In fact, the World Bank figures showed that Africa has been the least successful region of the world in reducing poverty, with the number of poor people in Africa doubling between 1981 and 2005 from 200 million to 380 million. So why isn't there more success to show for the billions of pounds which have been spent? And why is it that all too often the aid doesn't get through to the very people it is supposed to be helping? In Addicted to Aid, award-winning Sierra Leonean reporter Sorious Samura, a man well-known for asking difficult questions of Africa's leaders, examines these issues. He asks whether we might have got it all wrong, and if we have become distracted by arguments over how much money to give and paid too little attention to where it ends up. 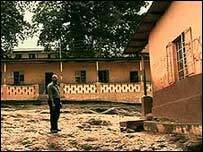 Samura begins the programme in the Sierra Leone hospital where he was born 45 years ago. There he meets Elizabeth, a new mother, whose son Joseph was delivered during a power failure after a difficult six days in labour. For Joseph, who like his mother is HIV positive, the challenges of growing up in Sierra Leone have only just begun. Samura also visits his first school, the place where he says the pupils got their first lessons in corruption when the teachers began demanding bribes off their students in return for good grades after the government stopped paying them properly. 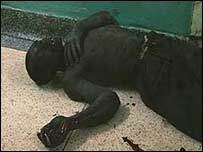 By 1977 the government of Sierra Leone had declared education a privilege and not a right, a situation which Samura says helped radicalise his country's young people and in 1991 led to the bloody decade-long civil war in which tens of thousands died. The war was brought to an end with the help of British troops and since then Britain has spent £220m helping to rebuild Sierra Leone's infrastructure. But despite this ramped up aid effort, Samura reports that life in the country is harder than when he was a young, with one in four children not making it to their fifth birthday and one in eight mothers dying in childbirth. Our reporter also travels to Uganda, which Western donors say is the success story of development aid in Africa. Clinics and schools have been built there in record numbers and today almost every Ugandan child has a place in primary school. But according to a recent World Bank report, six out of ten cannot read or write and when the bank's investigators made unannounced visits to schools they found that over three quarters of teachers were not in the classroom when they should have been. Gerard Mijasi Omalla, a teacher in a Kampala school, tells Panorama that the low salaries that educators receive mean that they have to take on other work to get by. "We cannot sustain our children so we have to go and look for alternative jobs like in factories, selling fish, tomatoes, to mention but a few," Mr Mijasi Omalla says. According to Mr Mijasi Omalla instead of spending money on building new schools and classrooms, many of which lie vacant, it should have been used to pay the teachers needed to man them. To find out if things are any better in the health system, Samura makes his own unannounced spot checks, accompanied by Andrew Mwenda, editor of Uganda Independent and one of a growing number of Africans questioning how aid is working. 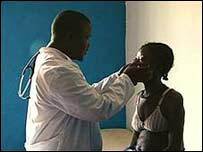 At one clinic designed to serve 30,000 people, four of its five buildings lie abandoned and there is no medication for patients who are suffering from malaria and bronchitis. Mr Mwenda tells Panorama that "donors' priorities are completely wrong". "They have poured much more money into celebrity diseases like Aids and forgotten that for most Ugandans, they are suffering from measles, from malaria, from tuberculosis, from cough and from flu and they do not have drugs for those," he says. This year alone the international community has given Uganda's healthcare sector over half a billion dollars, but a visit to Mulago Hospital in Kampala shows that not enough of the money is getting through. Entering the hospital, where over 50% of the patients are HIV positive, Samura is greeted by shocking scenes in which the sick and injured lie on the blood-spattered floor alongside discarded needles. In the maternity ward, where about 80 babies are born every night and about 20 caesarean operations carried out by one surgeon in one operating theatre, newborn babies and their mothers lie on the filthy floor surrounded by blood. Staff at Mulago Hospital tell our reporter that they struggle to get even the most basic supplies, such as gloves and the analgesic Paracetamol. But a trip to the car park at Uganda's Ministry of Health shows that money is being spent - just on other things. 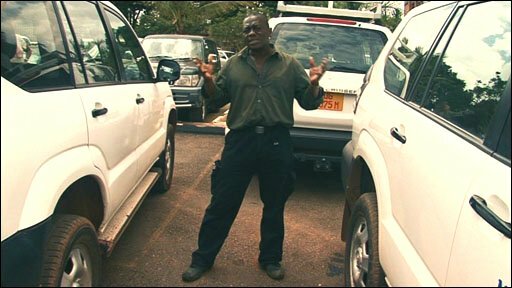 The ministry has bought 1,800 4x4 vehicles for its staff, but only four ambulances for Mulago Hospital. The Ugandan health ministry gave a statement to Panorama in which it defended its spending on equipment and the working practices of Uganda's hard-pressed health workers. It did admit that there is a problem with space in Mulago's labour ward, but said that a new labour suite is being constructed to address this problem. Mr Mwenda says that much of the money which comes from the international donor community "lines the pockets of civil servants, high end health workers and politicians". Samura meets Mike Mikula, one of three former Ugandan health ministers investigated over the alleged embezzlement of tens of millions of aid dollars. 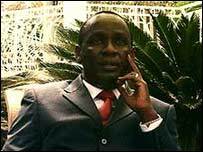 Mr Mikula denies any wrongdoing, but admits that the ordinary citizens of Africa do pay a heavy price because of corruption in the continent. As Samura reports, that is definitely true of Sierra Leone where he sees firsthand the selling of stolen aid supplies. 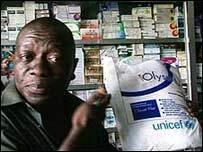 On sale in Freetown's pharmacies are mosquito nets and medicines from Unicef and the World Health Organization. These are supplied to the Government in Sierra Leone and are meant to be handed out to the country's vulnerable children free of charge. Instead chemists, who know these life-saving medical supplies and drugs are supposed to be free, sell them to parents ignorant of the fact, who often go hungry to buy them. But Samura also visits Kono district where foreign aid money is being used to great effect at a clinic set up to treat some of many people who had limbs hacked off by the rebels during the civil war. In fact, the clinic is so successful that now only 10% of its patients are amputees and patients are drawn from right across Kono district, and even from the neighbouring country of Guinea. The clinic is run by Dr Mohammed Barrie, who grew up in one of the poorest parts of Freetown, Kroo Bay. "The problem with the so-called development aid is that it is very difficult for the European and American consultants to understand the problems of these people. "I myself have lived in this place for a number of years during high school. I went hungry many times so I do appreciate the problems of these people and I do understand their needs," he explains.